Portals provide users with a single point of access to multiple types of information and applications through a Web interface. IBM WebSphere Portal for Multiplatforms is one of the industries’ most comprehensive portal offerings. It contains a wide range of portal technologies that help you develop and maintain B2C, B2B, and B2E portals. WebSphere Portal provides considerable flexibility in addressing dynamic changes in marketplace conditions through advanced integration, Web services, and collaboration technology. DB2 Information Integrator provides federated data access to a diverse range of heterogeneous data sources including relational data sources such as the DB2 family, Oracle, SQL Server, and Teradata, and semi-structured data from WebSphere MQ messages, XML documents, Web services, Microsoft Excel, flat files, ODBC or OLE DB sources, plus a variety of formats unique to the life sciences industry. It also provides integrated support for Lotus Extended Search, which enables broad content access to a variety of content repositories including DB2 Content Manager, as well as e-mail databases, document repositories, third-party Internet search engines, and LDAP directories. 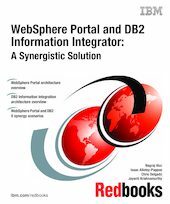 This IBM Redbooks publication provides examples of the synergy between WebSphere Portal Server and DB2 Information Integrator in delivering portal solutions, and will include sample portlets exploiting SQL, UDFs, JDBC, and Web Services.